Gone are the days when any list of celebrities in any sphere of entertainment will be occupied by adults and those who are well advanced in age and probably no longer performing. In our own time, a crop of young vibrant and uniquely talented celebrities are emerging in various spheres of endeavour. 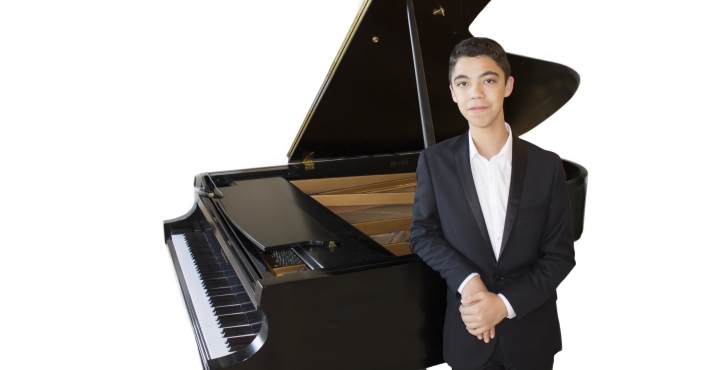 From entertainment to science and technology, millennials are notably securing their spots on the limelight and one of such is Ethan Bortnick. Ethan has done what many people who are older than him haven’t been able to do, still, there seems not to be any definite career milestones he can’t reach before he becomes an adult. He is a pianist who began playing when he was as young as 3. If you have been wondering why he is making a lot of buzzes recently, the paragraphs below will explain more. The American piano whizz-kid was born on the 24th of December in the year 2000, his birthplace was Pembroke Pines, Florida, where he was also raised by his parents – Hannah Bortnick (mom) and Gene Bortnick (dad), who are Jewish immigrants from Ukraine. He also has a younger brother named Nathan Bortnick. Growing up, when he was 3, the kid already had a special knack to play the notes of any song he hears, even for the first time. He started off playing on his piano at age 5, songs of legends like Elton John, Little Richard, Billy Joel, Bill Evans, and the Beethoven. A few years later, after going public with his rare talent, Ethan Bortnick began making television appearances and touring various countries like Japan, Canada, South Africa, Brazil, and Australia. The talented pianist has, since his debut, gone ahead to do things that ordinarily, a kid his age would not be concerned with. Ethan Bortnick started his National PBS Concert Special “The Power of music” when he was just 9 years, breaking the record as the youngest person to have his own PBS. Not long after, he recorded We Are the World 25 for Haiti with 70 other artists on the 1st of February 2010 for the Vancouver Winter Olympics. He recorded his first music album in 2011 and called it the creation Muscle Shoals, it was quickly followed by another album titled Alabama. His television show The Power of Music has been a huge success since it began, it was rated the number one concert pledge show on public television for 2014/2015 pledge drives and still runs nationwide. Due to his career successes and popularity, the kid has been on many television shows like The Oprah Winfrey Show, Tonight Show with Jay Leno and Good Morning America. Ethan Bortnick has notably been named one of Oprah’s All-Time Smartest, Most Talented Kids. One question that has been on the lips of many people is whether this kid star got his rare talent from his parents and/or has anyone in his lineage exhibited such mastery of music. From what we gathered, Ethan Bortnick’s parents Hannah and Gene Bortnick are not musicians but have been supportive since his mom – Hannah spotted the music talent of his son. Things changed for good with the kid on a certain afternoon when his mother heard and saw him playing the musical notes of a song being played on the radio. Ethan played with such precision and mastery that his mother was awestruck when he saw him. Hannah and Gene Bortnick subsequently decided to enrol their young child for piano lessons but this was partly delayed as Ethan’s brother – Nathan was already on the way. Nathan Bortnick was born with a rare heart defect which caused him and his mom to stay back at the Miami Children’s Hospital as he got proper medical attention. The kid has since then had a couple of surgeries and is doing fine. While Nathan was being treated at the hospital, Ethan was sent to live with his grandparents where he continued playing with a toy piano and was subsequently enrolled for proper piano lessons. His first piano teacher, Vaserstein, in no distant time also accented to how talented the kid was and encouraged him the more. He continued to learn under his teacher’s tutelage and soon began composing more complicated songs and grew to become who we know him as today. Ethan Bortnick; the American singer, pianist, music composer, songwriter, television personality, and philanthropist has certainly smiled to the bank very many times for doing just what he loves. He has a net worth reliably estimated to be about $3 million. Considering his age, talent and the potentials we have seen in him, his current financial standing is possibly just a scratch on the surface of what is to come for him.